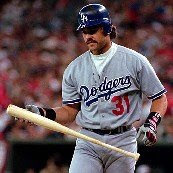 A Beautifully Messy Mass of Contradictions: Piazza, New York catcher, are you straight or are you gay? I LOVE Belle & Sebastian. Love, love, love, love, love. They have the best lyrics and some of the catchiest tunes out there. I love Meat Loaf and Lily Allen. But I love every album Belle & Sebastian has put out. I saw them in concert on their last tour, and they are amazing musicians. In most bands, members will trade off one or two instruments of the same type...these 8-9 musicians rotated every instrument on the stage. Cello to drums to guitar to horns. It was the most amazing thing. They don't even attribute writing or musical credits on many of their albums. Anyway, back in my youth, as many fag hags do, I fell in love with many a gay boy before I knew they were gay. Sometimes before they knew they were gay. I never fell in love with Mike Piazza. Or even really know who Mike Piazza is. But I like this song. And this line has been stuck in my head for a few hours. So there you go.